Community development seems a common concern for instructors in online writing courses, so one might assume that those of use concerned with community share the same goals; however, when embarking on an exploration of whether an assignment sequence or pedagogical tool has been successful in develop community in an online course, it’s prudent to explore what we mean when we reference “community.” What do we hope to achieve when we aim for community development? How do we best accomplish it? According to Jeremy Brent, community is actually an undefinable term because it is “moving, divided and incomplete” (219). What we long for when we talk about community is “the continually reproduced desire to overcome the adversity of social life” (Brent 221). Indeed, desire to overcome or achieve a purpose is a central component of other attempts to articulate community. Garrison and Vaughan describe community, or the “community of inquiry” “as the ideal and heart of a higher education experience” (14). They claim that the driving force behind community development is “purposeful, open, and disciplined critical discourse and reflection” (Garrison and Vaughan 14). While Garrison and Vaughan suggest that community is disciplined and purposefully created, Trena M. Paulus suggests that off-topic discussions have a hand in the development of an academic community “in the absence of a physical co-location” (228). For Paulus, community building requires the development of connections and the establishment of common ground. Off-topic discussions help students engage in “grounding,” the establishment of common ground or the “‘mutual understanding, knowledge, beliefs, assumptions, pre-suppositions, and so on’ (Baker et al. 1999, p. 3) that exist among people communicating together” (Paulus 228). Grounding goes hand-in-hand with connecting, which involves “affinity (small talk and humor), commitment (a sense of presence) and attention (negotiating availability for conversation)” (Paulus 229). Paulus explains that “connection is about interpersonal relationships, whereas common ground is about information exchange” (230). We can conclude then, that the development of an academic community in an online writing class requires both informal socializing with those whom we have established common ground as well as purposeful discussion and collaborative action to achieve academic goals. Old Dominion University’s English 724/824, entitled “Online Writing Instruction,” has given us an opportunity to examine the way in which community is created, or not, via the use of blogs. Students were required to post five successive blog entries reviewing scholarly articles on some aspect of online writing pedagogy. No two students were allowed to review the same article. My analysis of the community of learners in this course as well as the blog entries leads me to conclude that blogs are not the most effective tool for the development of community in an online course, though I do conceded that they may have some role to play. A review of blog entries for the course reveals that only about half of the students in the course engaged in commenting in any significant way. In fact, it seems that five of eleven students did not comment on others’ blog entries. Comments seemed to be based around several themes: seeking clarification about the article, expressing interest, agreeing with the article, or expressing disagreement with some aspect of the article. Of the approximately 57 comments posted in response to blogs, around 42% of those comments were posted by two very active commentators. Another student who posted nearly 16% of the comments on the blogs did so two days before the blog analysis was due. Some students responded to the blogs posted on their webpages, while others did not. One interesting thing to note is that there seemed to be a correlation between length of time in the Ph.D. program and lack of engagement with the blogs. Only about 22% of the blog comments were posted by Ph.D. students who entered the program during or before the fall of 2012 despite the fact that they make up 45% of the course enrollment. Students were not required to comment on each other’s blogs, but even if they had been required to do so, engagement with each other’s blogs would not be the most effective community building activity this course has afforded. Garrison and Vaughan say that communities of inquiry are open, and Paulus suggests that negotiation and the personal are important aspects of community building. Lori E. Amy claims that “the discussion lists and bulletin boards we ask students to use mimic virtual social spaces, such as the internet chatrooms in which many students ‘hang out’” (115). She claims that “Dissensus and healthy conflict are crucial arts of the contact zone, and we do need to structure spaces in which we engage one another in open, honest exchanges that engender ‘active, engaged discussion’ capable of sustaining passionate disagreement through which we can educate one another” (Amy 119). I agree with Amy on this point; however, I disagree with the notion that discussions and blogs that are posted for a grade mimic informal, online social hangouts. In discussing Blackboard, Gillam and Wooden develop a critique that is relevant to blogs. They say that Blackboard “positions the writer primarily as the isolated recipient of information, who contributes his or her thinking in discrete little bullets to the discussion forum or via various assessment instruments” (27). Blogs, like Blackboard discussion forums, encourage students to write in solitude, particularly when, as in the case with English 724/824, students are not allowed to write over the same subject. Interestingly, accidental violations of the assignment rules had the potential to engage students more deeply, since the shared knowledge of the articles gave them a common ground, an element vital to community, according to Paulus. Gillam and Wooden state that “we must encourage them [students] to see their complex ecological makeup and that of their collaborators, to mindfully participate in the formation of a new ecological community with their peer group, and to become cognizant of the ways in which those complex ecologies influence knowledge formation and communication” (28). The few occasions in which students accidentally reviewed the same article provide strong evidence that we are the product of our ecological makeup. For instance, Kelly Cutchin and I both reviewed Gillam and Wooden yet our summaries and reviews highlighted different aspects of the article and different applications of the theories discussed. Despite the fact that I had unintentionally violated the assignment guidelines, I found it exciting that someone else had read the same article I had and I purposefully sought out that review. This was the one instance in which I found myself hoping that my fellow student would respond to my comment and checking to see whether she had done so. To increase the chances of establishing common ground, blogs from the assigned readings could be required, but this changes the purpose and intended outcome of the assignment from resource compiling, writing in the disciplines, and reflection to simply an assignment focused in writing in the disciplines and reflection. Even if that were the case, there still might be potential issues with the community building, as blogs assigned for a grade are reflections of power differentials in the course and may not allow for truly open and honest exchanges. Try as we may, we students are keenly aware that the blogs will be graded. It’s possible that students may take that into consideration when responding to each others’ blogs. DePew and Lettner-Rust explain that “the power to survey and assess gives instructors sole authority in the class” (178). We students are aware of that authority when we engage with others’ work. True community development through the forging of connections must be facilitated in other ways that allow for collaboration, negotiation, and shared experience. One of the most interesting aspects of the blog engagement or lack thereof in ENGL 724/824 was that most of the Ph.D. students who engaged with blogs were newer students, while students who have been in the program for several semesters did not engage to a significant extent. There may be numerous reasons for this, but I feel that this resulted in part from a pre-existing idea that we are already members of a strong academic community. Even though the stated goal of the blog assignment was not to build community, the community analysis assignment suggests that it is an intrinsic goal. I would argue that the Facebook backchannel and group assignments have built community more effectively. Both have been places to discuss assignment expectations, to negotiate, to support, and to collaborate. Both have allowed for the forming of informal connections in an open manner while sharing information and working toward a goal with a purpose. Smaller group projects have required negotiation, information sharing, and connections, while the backchannel has served to make navigating the course akin to a larger group project. While students need to develop the backchannel themselves, they can be encouraged to do so. Kelly shared a 34 page document of our June 17 WebEx chat with the backchannel to support discussions of community. Daniel shared a Wordle that he created from the text. A backchannel chat from before, during, and after the course meeting in June 17 was 112 pages in length. Navigating the course itself seems to create more community than the blogs have done because rather than solely replacing the instructor as the knowledgeable informer, we have created knowledge socially and equally via the backchannel and group projects. Amy, Lori. “Rhetorical Violence and the Problematics of Power.” Role Play: Distance Learning and the Teaching of Writing (2006): 111. Brent, Jeremy. “The Desire for Community: Illusion, Confusion and Paradox.” Community Development Journal 39.3 (2004): 213-223. DePew, Kevin Eric, and Heather Lettner-Rust. “Mediating power: Distance Learning Interfaces, Classroom Epistemology, and the Gaze.” Computers and Composition 26.3 (2009): 174-189. Garrison, D. R., and Norman D. Vaughan. Blended Learning in Higher Education: Framework, Principles, and Guidelines. San Francisco: Jossey-Bass, 2008. Gillam, Ken, and Shannon R. Wooden. “Re-Embodying Online Composition: Ecologies of Writing in Unreal Time and Space.” Computers and Composition 30. Writing on the Frontlines (2013): 24-36. ScienceDirect. Web. 28 May 2014. Paulus, Trena M. “Online but Off-Topic: Negotiating Common Ground in Small Learning Groups.” Instructional Science 37.3 (2009): 227-245. Community is having a sense of belonging to a group. Several key concepts are embedded in this simplified definition, the first being the idea that community is sensed or felt on an emotional level. This intangible quality is also suggested in definitions that position community as “a phenomenon” that “does not appear to have a concrete existence” (Brent 214). Phenomena by their nature are not wholly quantifiable, but scholars can work descriptively to identify reoccurring aspects of community. A second key concept is that of group, which are based on common bonds; the commonality may be being part of the same course, program of study, or organization. Common bonds lead to having shared experiences. Communal experiences strengthen the group dynamic, creating shared history and increasing understanding; students feel closer when they have gone through the same challenges and successes. This also leads to a mutually constructed culture; the community establishes norms and expected/acceptable behaviors. Another key concept from that initial definition is belonging. Members of community feel that their some aspect of their identity is reflected by a specific group. However, self-identification alone does not lead to community inclusiveness. The individual must also be accepted by the existing group members. Therefore, a community both reflects and reinforces individual characteristics. Meaningful communities must emerge organically. For example, in any of the groups listed above, there will be certain interactions that are established: class meetings, discussion board assignments, or an organization’s event. These interactions may dictate participation in a group, but without that phenomenological feeling, this is not a community. Communities do not “exist in every place, and the differences between places are not necessarily based on the differences between them as communities” (Brent 217). In other words, a community may develop in one class and not in another, even if the conditions set by the instructor—the place— are identical. 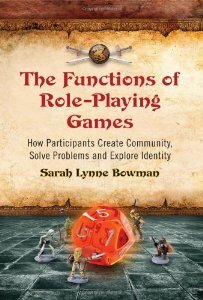 Camaraderie can be invited by the group interactions, but whether a sense of community emerges seems to rely on the unique chemistry and psychology of the group’s individuals. Public blogs are often assigned in online writing courses, with students interacting in posts and responses, but whether this interaction is a community or simply the surface appearance of one is debatable. On the one hand, “even if an illusion,” community “has very real effects” (Brent 216). Junco et al’s study suggests that requiring students to interact using Twitter did lead to greater student engagement and academic achievement by clarifying content and providing emotional support. Even if the students did not feel they belonged to a community, the participation had real effects as Brent suggests. Therefore, even if assigning blog writing and responding does not establish a meaningful community, it will encourage interaction that in and of itself has benefits. The assignment to write blogs in this course supports this argument because peer comments leads to affective relationships between classmates. I know that for me, when I saw that Carol, Laurie, Margie, and Daniel had left comments on my posts, I felt a greater sense of belonging and respect as a community member because I knew they took the time to read and respond. These relationships are then strengthened as I appreciated their efforts and reciprocated my feelings of respect. However, there is also the argument that embedded within all communities is “conflict and division” (Brent 214). Cliques will be present in an online setting because virtual “communities mirror inequity” in society (Amy 117). Students are bound to be offended, remain silent, and not participate at all (Amy 117). As a result, the interactive blog assignment could potentially result in the kind of power inequities and rhetorical violence that devastate community-building efforts. While violence did not occur in our class assignment, I can see how there was division. With the exception of Laurie, I have had previous classes with each of the aforementioned commentators. This suggests that within a community, previous experiences will impact how we interact. Others may feel excluded or not as well respected by some peers if they are not receiving the same level of interaction. Even if the selective interactions were a product of comfort rather than intentional exclusion, as Brent argues, effects can be very real. Another issue is that blogs are not “informal rap sessions with close friends,” they are performances in a class for grades (Amy 122). For example, in the responses I had to my first blog post, I responded to Laurie’s post directly, but when she responded it was to the thread of discussion started by Carol’s response. Then Margie started yet a new direction for the conversations. This shows that although students may be reading and commenting, this work is not necessarily integrated in a way that develops deep communication and community. Responses may only be “performing” interaction for the instructor audience where the performance is satisfied by the existence of a post without sustained involvement. Interaction has benefits even if that it does not result in a sense of community, so requiring commenting on blogs is worth noting as a design element. However, it is possible use assignment design to also encourage community in an online course if the right intangible mix of students exists—primarily with synchronous activities that can serve “the needs of writers in terms of forming community” (Breuch 151). Breuch notes that “speech patterns and behaviors become lost because of the disruptions of time and space that occur in virtual environments” (144). For example, when Margie left her comment on the first blog entry, I had already posted the last review and I did not respond to her directly. Online students can read and respond to one another at any time, but this can result in responses being posted after the writer has moved on to other assignments and concepts. If we responded to one another in real time, like we did with the tool review, it could overcome any time-related irrelevancy. Maybe adding break out groups, as afforded by Adobe Connect, would help students to engage with the reviews and build conversation that eliminates the effects of time separation. These groups could also help “students have the opportunity to get to know one another,” fostering new relationships and mediating the potentially divisive pre-existing relationships (Breuch 148). As many of my peers will probably discuss, our community lives vivaciously outside of the blogs in our Facebook class group. I started this closed group before our first class meeting, and was inspired to do so after having the experience of being invited to a group for previous classes. I wanted to repeat the positive experiences of support, humor, and clarification of content, which seems to align with Brent’s argument that “the concept of community always seems to contain nostalgia, the idea of an imagined past” (220). We also use this space to build community because it mimics the informal conversation and interaction that occurs in informal physical spaces like student lounges. Through sharing emotional experiences and challenges, we engage in the history-making, culture construction, and norm setting that builds community. Carol has even noted that she was not much of a Facebook user before the class, but engages there more and more. This is because even though a “community may lack tangible substance…it possesses a gravitational pull, a magnetic existence that creates real effects - at its best, social relationships of mutual care and responsibility” (Brent 221). We create these outside communities because we “desire to overcome the adversity of social life” (Brent 221). The adversity of graduate school is very real, and we all express feeling insecure about our abilities and our right to belong to the larger PhD program. We create community to feel accepted as we are, to find “connectedness in all [our] imperfections” (Brent 222). While the instructor may not be able to do more than set conditions for community to grow, not standing in the way of these informal connections is an important step in facilitating community. Past experiences and indirect instructor support are two powerful reasons why interaction outside the course assignments will occur and foster community. Educational communities have enormous benefits to students. They often provide support and assistance both for personal and academic challenges. For groups facing especially difficult academic expectations, this support system function of community can help people enter “the maelstrom rather than succumb to it” (Brent 216). This support system can often be the difference between discontinued or sustained academic participation, and should therefore be encouraged at every level of the institution. Amy, Lori E.. “Rhetorical Violence and the Problematics of Power: A Notion for the Digital Age Classroom.” Role Play: Distance Learning and the Teaching of Writing. Eds. Jonathan Alexander and Marcia Dickson. Cresskill, NJ: Hampton Press, 2006. 111-132. Print. Journal 39.3 (2004). 213-223. Web. 17 Jun. 2014. Breuch, Lee-Ann Kastman. “Enhancing Online Collaboration: Virtual Peer Review in the Writing Classroom.” Online Education: Global Questions, Local Answers. Eds. Kelly Cargile Cook and Keith Grant-Davie. Farmingdale, NY: Baywood, 2005. 141-156. Print. Junco, Reynal, C. Michael Elavsky, and Greg Heiberger. “Putting Twitter to the Test: Assessing Outcomes for Student Collaboration, Engagement and Success.” British Journal of Educational Technology 44.2 (2013): 273-287. EBSCO. Web. 26 May 2014. When I set out to do a review of a pedagogical tool to facilitate student-centered learning by fostering engagement in either a hybrid or online-only course, I intended to focus on the a variety of tools embedded within Desire2Learn (D2L) that could be used for just such a purpose, but the uniqueness and complexity of Wiggio, a productivity platform used to facilitate group meetings and collaboration, necessitated an in-depth look at this particular tool. The capabilities offered by Wiggio are not new, but what Wiggio does that many platforms do not is offer a combination of capabilities that is usually achieved through the use of multiple platforms or programs, and while Wiggio is embedded in D2L, those who do not use the D2L learning platform can still benefit from Wiggio. Wiggio, which is marketed primarily to academic communities, offers a host of productivity and collaborative tools ranging from a convenient method of setting up a face-to-face meeting to holding group meetings in video chat while synchronously working within a word-processing program. The FAQ section gives a quick run-down of the offerings: “mass messaging (emails, text messages, voicemails), scheduling, file sharing and editing, polling, conference calling, video conferencing, and project management” (Wiggio.com). The program is entirely web-based and requires no software downloads. Users can access a free version of the platform by making an account through Wiggio’s website, but there is a premium version available, such as that embedded in D2L. Wiggio can be used to set up a group by first defining asynchronous group communications such as listserv email exchanges, receipt of short messages by SMS and longer messages via email, receipt of a daily summary of communications, or discussion boards with no mailed message. Once a group has been established, group members are invited. Text-based or video messages can be sent by group members to other group members from within the platform. Rather than having to upload a video message, the program includes an embedded video recorder. Without changing navigating to a new webpage on the Wiggio site, group members can share files, share links, launch a meeting via teleconference or video conference, create a to-do list, create a poll, send a message, or schedule an event or meeting on a group calendar. Sub-groups can be created within established groups. The meeting platform allows users to chat via text, share files, share a desktop, share video and audio, use a whiteboard, and synchronously edit a shared document. This combination of capabilities is akin to adding Google Docs to WebEx in an interface that also allows for file sharing, emailing, text messaging, video messaging, surveying, and calendar scheduling. Wiggio has a bit of a minimalist feel, and there may be fewer bells and whistles in the combined interface than may be found in systems that offer similar capabilities separately, but Wiggio’s developers argue that the features that are left out aren’t necessary for productivity and collaboration. This argument is convincing because it’s likely that Wiggio users will feel that the convenience of a one-stop-shop for group communication and productivity outweighs the loss of a few features that they could do without anyway. A survey of the capabilities offered by Wiggio clearly suggests that the platform can be used to encourage student engagement in an online or hybrid course, but the question of how the platform can be used specifically to support best practices in online writing pedagogy remains. Perhaps one of the first places we should look for guidance on the value of Wiggio in online writing instruction would be the “Position Statement of Principles and Example Effective Practices for Online Writing Instruction” published by the Conference on College Composition and Communication. Principle 11 states that, “Online writing teachers and their institutions should develop personalized and interpersonal online communities to foster student success” (Oswal). In the rationale for the development of this principle, the authors explain that a feeling of connectedness to each other and the instructor helps students be more successful. While encouraging student engagement with the goal of student success in mind is a worthy goal, best practices in writing pedagogy call for strong student engagement because it encourages students to grapple with theoretical concepts it helps them to understand writing as a social activity. In “Mediating Power: Distance Learning Interfaces, Classroom Epistemology, and the Gaze,” Kevin Eric Depew and Heather Lettner-Rust apply Paulo Friere’s advocacy of “problem-posing education” to composition pedagogy by claiming that a participatory and liberatory approach to composition, much preferable to an instructor-centered approach, can be facilitated “through experiential and participatory activities, such as open dialogue, collaboratively designing or modifying assignments and allowing for student interest to alter the direction of the syllabus as a means of creating an egalitarian dynamic among students and instructor” (177). Such a participatory and liberatory approach requires a class design that allows for such open dialogue to take place. InBlended Learning in Higher Education: Framework, Principles, and Guidelines, D.R. Garrison and Norman D. Vaughan advocate for the development of a Community of Inquiry which requires that students have the opportunity to express themselves openly, that they have opportunities for reflective and interactive learning, and that students are guided by a teacher who provides “students with a highly interactive succession of learning experiences that lead to the resolution of an issue or problem” (25). Common distance education tools, such as discussion threads and blogs, do allow for some dialogue to occur, but participatory and interactive activities are often difficult to facilitate within learning management systems, and often the conversations that take place within discussion boards (the most common tool for facilitating group communication) are aimed at satisfying the instructor rather than being an organic and student-driven exchange of ideas. As a solution, many instructors have turned to the use of multiple supplemental tools (such as Google Docs) to achieve pedagogical goals. By offering several tools for facilitating collaboration, Wiggio allows for the development of this kind of participatory class environment. In “A MOOC with a View: How MOOCs Encourage Us to Reexamine Pedagogical Doxa,” Halasek et al., describe how a MOOC that they created challenges the notion that MOOCs cannot support effective pedagogical approaches to the teaching of writing. Halasek et al., found that the large enrollment in the course prevented them from taking what they call the “Teacher Knows Best” role (the teacher provides the instruction and feedback) and required students to take a larger role than the “Attentive Student” role (the student listens to content and follows directions; in fact, the roles seemed to have reversed here (157). Halasek et al. found that “no longer solely (or even largely) responsible for the shape of the course, the direction it took, or how the participants engaged the material” (160). Though the CCCC recommends an enrollment of no more than 20 students in online writing courses and the MOOC that Halasek et al. created had an enrollment of tens of thousands, we may be able to learn something from the way in which the MOOC encouraged student-centered learning. Perhaps the multiple ways in which students can interact in Wiggio and the participatory activities it allows could facilitate this type of role-reversal in online composition courses. If we can use Wiggio to challenge the “banking concept of education,” what strategies might we use in order to do so? Ken Gillam and Shannon R. Wooden suggest an ecological approach to the teaching of composition designed to help students understand writing as part an ecological act done within a community and for a specific purpose. The assignment sequence incorporates distribution, emergence, embodiment, and enaction. The ideal online course incorporating these principles, according to Gillam and Wooden, would include scaffolded assignments beginning with group negotiation of a topic of exploration, data collection via a group constructed survey, multimodal presentation of findings, a collaborative annotated bibliography, and an individual final project (a problem/solution paper accompanied by a reflection paragraph). Another example of a collaborative assignment sequence is described by DePew. In order to facilitate students’ development of rhetorical literacy and a sense of audience awareness, he suggests students use literacy narratives to develop a literacy survey, the results of which they will use to compose a corroborative report. How might Wiggio be used to facilitate these assignment sequences described by Gilliam and Wooden and DePew? Wiggio can be used to facilitate group communications in a variety of modes (email, text, teleconference, video conference, video messaging, and video conferencing). Surveys can be created within the Wiggio interface. Without leaving the interface, students can collaborate synchronously on projects and easily provide their peers with feedback. While it’s very possible for students to conduct such collaborative projects with other technological tools, Wiggio offers all of necessary tools in one interface. CCCC. “A Position Statement of Principles and Example Effective Practices for Online Writing Instruction (OWI).” http://www.ncte.org/library/NCTEFiles/Groups/CCCC/OWIPrinciples.pdf (2013): 1-35. DePew, Kevin Eric. “Preparing Instructors and Students for the Rhetoricity of OWI Technologies.” N.d. M.S. “Frequently Asked Questions.” Wiggio.com. 2001. Web. 16 June 2014. Halasek, Kay, et al. “A MOOC With a View: How MOOCs Encourage Us to Reexamine Pedagogical Doxa.” Invasion of the MOOCs: 156. As resident advisor (1992-1993), head resident (1994-1997) and director (1998-2000) of the Virginia Summer Residential Governor’s Schools for Humanities and Visual & Performing Arts, I worked with a team of student life staff to develop the community of learners among our faculty, staff, and 400 high school students. We did this in a number of successful ways, including icebreakers, name tags, hall meetings, living arrangements, and the like. We called ourselves a community of learners, and all of us — faculty, staff, and students alike — lived in dorms on campus and called each other by first name. This experience informs my idea of “community” in several different ways. Community is never entirely “built,” despite the use of the term “community building.” In an educational setting, community must continually be “being built”; intentional activities, communications, and rhetorical choices (like the use of first names or the common language of living in the same dorm) must be made throughout the entire experience to ensure that a sense of community remains. Brent (2004) affirms this concept of community as continually built: “Here incompletion is a dynamic concept – the dynamism which community has which no definable entity could possibly possess” (p. 219). Community focuses members and potential/incoming members in a common goal. In Governor’s School, our community of learners sought to expand knowledge and understanding of the interrelationships among disciplines through guided inquiry. Teachers facilitated inquiry and participated with students in growing their understandings of concepts like body image, politics, economics, social structures, and more. All aspects of the experience — intellectual, interdisciplinary, and social-emotional; curricular, co-curricular, and extra-curricular — focused on growing knowledge and identity. Common, structured, facilitated inquiry shaped our community and represented Harrison & Vaughan’s (2007) interpretation of a community of inquiry consisting of cognitive, social, and teaching presence. Community is ideally an egalitarian function of participants working toward a common purpose. I include the modifier “ideally” because Amy (2006) recognizes the reality of power politics within rhetorical communities, and because the teaching presence in a community of inquiry necessarily invokes a hierarchical power structure between student and teacher. However, to the extent possible, community is a function of equals working together. In the classroom, a focus on students working toward a common purpose is an important aspect of community building. Given this concept of community, blogs can be useful tools for community development, especially when implemented in combination with other distance learning tools to continually maintain the sense of community. I would hesitate to privilege blogs over other writing spaces and online interactive tools, despite their potential interactivity, because other tools may help foster a sense of community more directly. As our own class use of the interactivity of the blogs reflects, blogs don’t necessarily encourage ongoing conversation. Few writers responded, either directly or indirectly, to comments on their blogs. We tried to post comments to several classmates’ blogs, but few posts or comments generated any kind of give-and-take among writers and/or respondents. Since Blogger does not afford any sense of threaded conversation using visual design or verbal cues, respondents had to include explicit textual clues (e.g. “In response to your idea…”) in order to “respond” to one another. A comment can’t be addressed specifically to another comment, only generally attributed to the blog. The result is a flat list of comments that offers no hierarchy, more like a chat transcript than a threaded discussion forum. In terms of community building, blogs do little to help writers and commenters work together in a community of inquiry, and this is especially true of Blogger. Blog posts “talk” at other bloggers, but offer little to afford conversation, dialogue, or rhetorical listening among participants. For this reason I consider WordPress, which provides clues that afford limited threading in comments, a more successful blogging tool for enabling conversations. Building a Better Blogging Community? For blogs to be successful at encouraging conversation among writers and respondents, instructors need to provide clear guidelines and structure for posts and responses. Carefully constructed, scaffolded assignments accompanied by clear expectations for interaction enable students to respond with agency within the limits of those guidelines. While instructor-provided frameworks may be seen as opposing social constructivist learning and pedagogy, OWI requires a level of structured interactivity that f2f classes can allow to occur more organically. DePew & Lettner-Rust (2009), DePew (forthcoming), Danowski (2006), and Breuch (2005), to greater or lesser extents, all encourage OWI teachers to recognize this power structure while developing scaffolded, structured activities that encourage agency and ongoing conversations. These conversations engage students in communities of inquiry, and these communities of inquiry, as conversations engaging students and teachers, help maintain ongoing community building. As a result, this assignment might have more successfully built a sense of community as a specific framework of scaffolded assignments. While a series of initial posts could remain focused on instructional tool reviews, each student could be required to comment on a number of reviews (perhaps 2 or 3), then write a full-length post that summarizes those three reviews, links to the initial posts, and reflects on one or more aspects of the initial review. Ping backs from those links could function to notify students that others have linked to their posts; the guidelines for responding could require the writer of the original review to respond to the summary post. Guidelines and requirements would have to be carefully detailed and written, but the result would be ongoing conversations about the effectiveness of instructional tools. As Breuch (2005) notes in relation to virtual peer review, assignments should “encourage students to think of virtual peer review in terms of concrete goals” (p. 149). In this case, the concrete goal might be to draft a final blog post that requires students to select three favorite instructional tools from among those reviewed, reflect on the conversations that surrounded that tool among all the commentators, and make a recommendation, with rationale, for one tool the student might recommend to other instructors in an OWI setting. My experience of this class, and the other two classes I’ve taken so far in the PhD program, is that community really forms in various informal channels of communication. While scaffolded blog postings and responses and discussion forum posts and responses contribute toward a community of inquiry, stronger bonds form around informal channels like the ODU PhD and individual course Facebook groups, email and Facebook communications outside of class with classmates, and through the Webex chat (which I’ll refer to as a “front channel” to differentiate it from a Facebook group “back channel”). As equals (students) working toward a common goal (success in individual courses, success in individual class sessions), informal community is continually formed and reformed around various struggles, activities, and challenges. For example, our class members united around the challenge of being unable to access readings in what we considered a timely fashion. We asked one another whether anyone had emailed the instructor, discussed whether texts might be available in open-source formats online, and generally bonded over our frustration. In Amy’s (2006) terms we recognized and capitalized on power differentials in our contact zone: a reference librarian held the cultural capital of quick access to open-source texts and shared that capital in our common goal of seeking resources; other members of the class held the cultural capital of temerity, willingly emailing the instructor to achieve the common goal of requesting access to readings in Blackboard. Throughout the semester, community was continually built, refined, and reshaped (Brent, 2004), often the result of working through tensions in different contact zones (Amy, 2006). Two specific examples occurred when shifting out of Webex, first into Google Hangouts and again into Adobe Connect. In each of these instances, the backchannel took the forefront in alleviating anxiety as we wondered how or if we’d be reconnected to our assigned groups. Those with more experience held social capital and shared assurances with those with less experience; in my group, my own familiarity with Google Hangouts helped me assure others in my group and in other groups that all would work out, while Kristina’s familiarity with Adobe Connect provided assurance and instruction to those of us who had not used the tool. In both cases, our bonds of community were strengthened through tension and power differentials among ourselves — power differentials used to achieve common goals rather than forming around us-them rhetorical violence. Does community happen in the face-to-face video sessions via Jabber and Webex? Sure, but those experience are built around the instructor. Student community is built through informal communications that are outside the structured activities of the class. As a future OWI teacher, I need to remember my own experience with community development and understand the power of multiple communication channels. Amy, L. E. (2006). Rhetorical violence and the problematics of power: A notion of community for the digital age classroom. In J. Alexander & M. Dickson (eds. ), Role play: Distance learning and the teaching of writing (pp. 111-132). Cresskill, NJ: Hampton Press. Breuch, L. K. (2005). Enhancing online collaboration: Virtual peer review in the writing classroom. In K. C. Cook & K. Grant-Davie (eds. ), Online education: Global questions, local answers (pp. 141-156). Farmingdale, NY: Baywood. Danowski, D. (2006). Anyone? Anyone? Anyone? Leading discussions in cyberspace: e-Journals and interactivity in asynchronous environments. In J. Alexander & M. Dickson (eds. ), Role Play: Distance Learning and the Teaching of Writing (pp. 97-108). Cresskill, NJ: Hampton Press. Garrison, D. R., & Vaughan, N. D. (2007). Blended learning in higher education: Framework, principles, and guidelines. San Fransisco, CA: Jossey-Bass. Wach, Howard, Laura Broughton, and Stephen Powers. “Blending in the Bronx: The Dimensions of Hybrid Course Development at Bronx Community College.” Journal of Asynchronous Learning Networks 1 (2011): 87. Academic OneFile. Web. 12 June 2014. In this article, Wach, Broughton, and Powers describe a faculty development program at Bronx Community College (BCC) in which faculty members are trained in hybrid course delivery over a six month period (June to January). BCC, a branch of City University of New York (CUNY) is very supportive of a move toward hybrid course delivery as it helps use an online environment to build an active, collaborative learning environment in blended versions of high-enrollment courses. Wach, Broughton, and Powers explain the faculty training program that requires a six month program beginning with a face-to-face workshop (on topics such as pedagogy, best practices, content presentation, disability accommodations, instructor presence, facilitation of communication, collaboration, and assessment) lead by experienced online instructors. After the initial workshop, course-developers (instructors in training) spend several months developing an online hybrid course with the oversight of peer mentors and student technological assistants who help faculty and students with technical assistance, tutor student peers on content-related issues, and assist faculty with content presentation. The development and assessment of hybrid courses is guided by the use of several types of documents: a contract created by the new instructor outlining how the course will be developed, a teaching guide that outlines best practices and expectations for instructors, a learning unit planning guide emphasizing engagement, collaboration, and improvement of student learning generally, and an online course development checklist that new course-developers use for self-evaluation through the development process. In November, following course development, mentors, guided by a rubric, perform an evaluation of the newly developed course and make suggestions for revision. Revisions are made in preparation for the course to be launched the January following the beginning of the program. I chose to review this article because of its relevance to my own project of creating an effective hybrid course and then creating a workshop describing how such a course could effectively be created. That BCC has such a streamlined, formal process for the training of new hybrid instructors is very impressive, but without such strong institutional support for such faculty development, similar lengthy training programs would be difficult to undertake, particularly since those involved receive incentives from the institution to teach hybrid courses and act as peer mentors. While not all institutions have the same goals, interests, or resources, the program at BCC seems to be a good model for making a concerted effort toward increasing the number of hybrid courses as well as the quality, so anyone interested in faculty development and departmental or institutional moves toward increasing hybrid offerings would have in interest in examining this model. One thing that I felt was missing was a deeper discussion of the theory or ideology driving BCC’s and CUNY’s move toward hybrid courses, as such justification for course development could be useful to others. Watch the video below for a tour of Penzu and discussion of how it could facilitate the use of journals in an online writing course (complete with audio appearances by John and Francesca...). For online writing instructors looking to incorporate an interactive journal component into their courses, Penzu is web-based diary that could easily facilitate such an educational purpose. Basic journal accounts on Penzu are free with a valid email address. Penzu emphasizes personal privacy and boasts of military-grade encryption, which together with the distinguishes this service from public blogs or websites. The interface has the appearance of a paper notebook with the current date and the option to title the entry. Text is entered in the body of the page. A tool bar at the top of the pad allows for numerous format and font changes, insertion of images, and sharing a link to the individual entry via email. One fun feature is the inspiration light bulb that will display a quote or question at the top of the entry that writers can respond to if searching for a topic. Easy to use, intuitive interface that mimics a notebook page. Automatic prompts can help the reluctant writer find a topic. Individuals with whom the entry link has been shared will receive email notification, and can easily add comments by simply responding to the email. Users will receive an email notification that a comment has been left and will see an alert upon logging in. Comments can be viewed at the top of the entry, but do not interact with the entry itself. At anytime, the user can choose to “unshare” an entry and link becomes invalid. Users can share single entries, but not the entire journal, selectively by email. They can choose to have the entry appear in the email, or just provide a link. The latter affords greater student control as the instructor will not have an archive of the text. Instructor comments appear at the top of the entry, but do not interact with the entry itself, keeping the integrity of the student work in tact as opposed to inline commenting that can make students feel self-conscious. Work is automatically saved to the cloud as typing occurs, to more closely mimic the experience of writing on paper and more readily preserve the entry. From a table of contents list, there is a search function that allows users to enter keywords to find related entries. Users can also request to be sent reminders to create entries at regular intervals. The content is completely controlled by the user and can be deleted entirely at any time. Table of contents and search feature allow for retrieval of entries for potential use in formal writing. Students can set reminders in accordance with assignment requirements. Penzu also has free mobile apps for iPhone and Android, so users can add entries on these devices as well. Accounts can be started on the website www.penzu.com, or the apps can be downloaded from iTunes or Google Play as well as from the website. Although the audience for the free accounts is primarily the general public, but they do offer a classroom version with greater functionality for a $49.00 annual fee. Some of the educationally-aimed features of that service are the option to provide inline comments, a grade book, assignment creation, and centralized management of all student work. A list of the added functionality of the classroom version, notably centralized management of student submissions and letting students create entries by email for easier access. Overall, Penzu is a quick and easy close-approximation of the paper journal, with additional affordances and enhanced privacy. This tool would best be adopted in composition courses by instructors wanting to add a dialogue journal component to their courses. Dialogue journals are an ongoing conversation between the instructor and individual students that foster positive rapport, engagement, and academic achievement (Holmberg qtd. in Danowski 100). Students can be given writing prompts that may or may not be related to course content, but both types help students improve writing skills and develop stronger relationships with the instructor, an important determinant of student success and satisfaction. This type of written exchange is highly interactive, which is “vital is successful pedagogy” (Danowski 99). It is important to consider how to develop interaction like this so as to mediate students’ feelings of social isolation as noted by Mann, Varey, and Button and Huws (qtd. in Hantula and Pawlowicz 150). This kind of low-stakes writing also reduces student anxiety and provides a comfortable space for exploration outside of the public sphere. Although discussion boards can promote a sense of community through student-to-student interaction, students can sometimes be reluctant to expose their ideas and display their skills in such a setting. However, online composition instructors should strongly consider incorporating journals since learners in communities of inquiry must have the “freedom to explore ideas, question, and construct meaning,” which journals can provide (Brabazon 15). Private journals can offer the benefits of low-stakes writing without the pressure of the larger peer audience and have been a staple of FYW programs, but have been difficult to simulate in an online setting. Yet we should strive to find ways to incorporate time-tested pedagogical practices into online courses rather than abandon them in favor of activities using new technologies, remembering that successful online education “e-learning ‘is marked by a juxtaposition of new technology and old pedagogy’” merging “the best of traditional and Web-based learning experiences” (Brabazon 7-8). And journals are certainly one such traditional pedagogy, credited with aiding prewriting, generating and organizing ideas, promoting creativity, providing a pleasurable experience with writing, and encouraging critical thinking (Danowski 103). It is also encouraged that instructors begin with “pedagogical assumptions” that de-emphasize “the search for technological solutions,” to start designing online courses around pedagogy and not around the affordances of a particular technology (Cook 59). The free, basic version of Penzu provides instructors this kind of blended approach honoring the tradition of journal benefits with the needs of teaching and learning online. It is an easy to use system for encouraging private student writing that can be selectively shared and features a comment function to facilitate dialogue. In addition to the relational and educational benefits of dialogue journals, they also afford greater student agency over their own writing, a significant difference from similar types of writing assignments facilitated by traditional course managements systems like Blackboard. Penzu shifts the ownership of the work from the course to the student. With this program, students have their own space to write outside of the course, and they choose which entries they share with the instructor. They can also use the “unshare” feature to revert an entry to private, and they can choose to deactivate the account entirely upon the completion of the course. While it is unclear what entities might have access to entries at Penzu, the student is at least not conceding ownership to the school. Nevertheless, this ownership is something “administrators and instructor[s] need to understand the implications of” when “selecting OWI technologies” (DePew). Students control their own archives, which is an ethical position in the conversation of technology-mediated composition. This autonomy mirrors the shift toward independence in technologically mediated learning and future working environments (Hantula and Pawlowicz 153). The student-centered focus continues with the features of mobility and accessibility that favor their lifestyles. Blackboard can be cumbersome to navigate on phones and tablets, with numerous log-in screens and multiple pages to click through before accessing the discussion board. Often these devices are not fully supported by the system and do not display full functionality. However, these are the preferred devices for students, and Penzu’s simple interface, cloud storage, and mobile apps afford additional, direct access to the journal without the obstacles of Blackboard. They can also write an entry wherever and whenever they have time with their phones, which accommodates their often busy lifestyles - a student could write an entry as quickly as a text message when on a work break or riding a bus. One of the other benefits is that Penzu is free, which is important to both students and budget-conscious departments when considering new services. It is also much simpler technology to learn because it approximates the familiar notebook, which is an advantage—especially for non-traditional students who are often enrolled in online courses for lifestyle reasons— over other blogs that have far more functions that can distract from the kind of freewriting that make journals successful and have more complex interfaces that may even require basic html knowledge. Unlike simply assigning and responding to freewrites though, Penzu keeps student writing collected and the search function allows for the retrieval of what often amounts to prewriting for formal assignments. These benefits in particular fulfill the CCCC OWI Principle 1, which emphasizes financial accessibility, flexible access, and simple, intuitive use for all users regardless of technological proficiency (Hewett 6). Responding to dialogue journals is time-consuming, which can be a challenge for online writing instructors who are already investing more time than for face-to-face classes. However, the investment builds strong rapport, which facilitates motivation, effort, achievement, satisfaction, and retention. The benefit of dialogue journals is what often encourages instructors to use them despite the increased workload, but Penzu may help make the work faster. When the student shares the entry, the instructor can both read it and respond to it in their email. The instructor is then also freed of the cumbersome interface and navigation of the course management system and can respond to students as easily as they can create entries, anywhere and on anything that allows email access. While this may potentially clog already overburdened email accounts, the instructor could create a dedicated email address for journaling or consider upgrading to the classroom version. Warnock suggests several methods for journaling online, but none (blogs, emails, Word documents, or message board threads) offer the agency, privacy, or accessibility of Penzu (103). Overall, this program should be tested in a classroom setting for broader use in dialogue journals in an OWI course. Brabazon, Tara. Digital Hemlock: Internet Education and the Poisoning of Teaching. Kennington, NSW: University of New South Wales Press, 2002. Print. Cook, Kelli Cargile. “An Argument for Pedagogy-Driven Education.” Online Education: Global Questions, Local Answers. Eds. Kelli Cargile Cook and Keith Grant-Davie. Farmingdale, NY: Baywood, 2005. 49-66. Print. Danowski, Debbie. “Anyone? Anyone? Anyone? Leading Discussions in Cyberspace.” Role Play: Distance Learning and the Teaching of Writing. Eds. Jonathan Alexander and Marcia Dickson. Cresskill, NJ: Hampton Press, 2006. 97-108. Print. DePew, Kevin. “Chapter 14: Preparing Instructors and Students for the Rhetoricity of OWI Technologies.” unpublished manuscript from Foundational Practices of Online Writing Instruction. Eds. Beth Hewett and Kevin Eric DePew. Hantula, Donald A. and Darleen M. Pawlowicz. “Chapter Six: Education Mirrors Industry: On the Not-So Surprising Rise of Internet Distance Education.” The Distance Education Evolution: Issues and Case Studies. Eds. Dominique Monolescu, Catherine Schifter, Linda Greenwood. Hershey, PA: Science Publishing, 2004. 142-162. Print. Hewett, Beth. “Chapter 1: Foundational Principles that Ground OWI.” unpublished manuscript from Foundational Practices of Online Writing Instruction. Eds. Beth Hewett and Kevin Eric DePew. 1-48. Warnock, Scott. Teaching Writing Online: How and Why. Urbana, IL: NCTE, 2009. Print. Google Apps for Education is a suite of cloud-based applications provided free of charge to educational institutions for their students and faculty. Among the applications are Gmail (email), Docs (word processing), Drive (cloud-based storage), Site (web pages), Slides (presentations), Sheets (spreadsheets), and Calendar (Google, ca. 2014a). This review addresses the individual and collaborative composing affordances of Google Docs and the group sharing affordances of folders in Google Drive. While Google Docs and Google Drive are free-standing applications available to anyone with a Google account, this review focuses specifically on the tools as part of Google Apps for Education. Google and campus IT departments collaborate to install Google Apps for Education to become students’ (and optionally, faculty’s) default email and file-sharing applications. The Google Apps for Education benefits page insists that, when installed, “Your data belongs to you” (Google, ca. 2014a.) Closer reading of the Google Apps for Education Agreement indicates that data are stored on Google servers that are not necessarily on U.S. territory, and that location of the storage facility itself is not determined by the campus IT department (Google, ca. 2014b). Campus decisions to implement Google Apps for Education are fraught with competing issues of price (free) and convenience (very) pitted against data access, location, and institutional control. Campuses that elect to install Google Apps for Education make available the free suite of applications to their students. Email addresses are tied to the campus student information system (e.g. Banner or PeopleSoft) and used as Google Accounts to provide access to the applications. File sharing services that may originally have been handled by on-site servers (like a shared drive) transition to cloud-based Google Drive, with free accounts providing gigabytes of data storage per account. As Google’s cloud-based word processor, Google Docs is deeply integrated into Google Drive; Google Docs is among native applications available in Google Drive when creating a new file (other applications include Presentation, Spreadsheet, Form, and Drawing; see Figure 1). Figure 1: Native applications available in Google Drive. 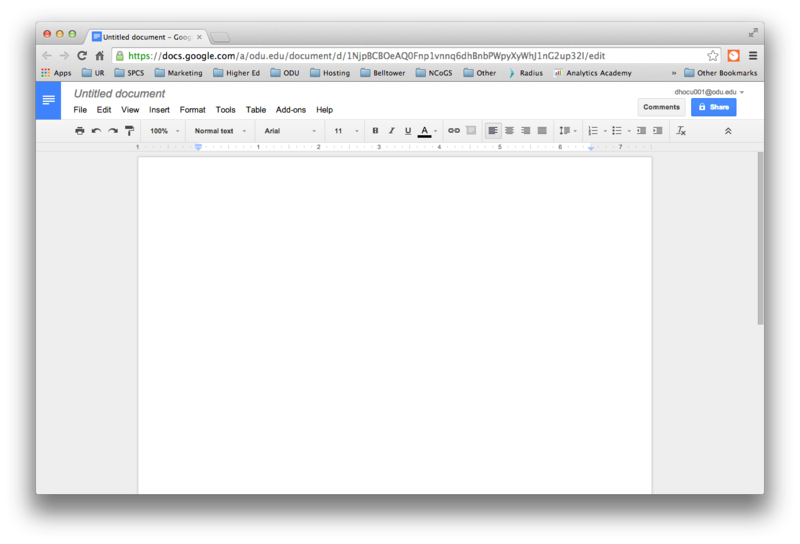 Screen capture of ODU Google Drive interface. As a word processing application, Google Docs uses a relatively familiar interface that resembles locally-installed applications like Microsoft Word or Office.org. Familiar menu items and icons represent standard functions, and the on-screen layout represents the printable surface of the document, complete with margins and page borders (see Figure 2). Figure 2: Google Docs interface resembles standard application interfaces. Screen capture of an untitled document in ODU Google Docs. Google Docs’ print output features don’t match those of stand-alone applications like Microsoft Word. Such limitations are well documented (Jesdanun, 2013; Leonard, 2014); among them are limited header and footer formatting (important for academic assignments), limited table of contents, and limited pagination options. Since Google Docs is web-based, its functions are limited to standard or proprietary HTML affordances. Beyond print output constraints, Google Docs is a capable, easy-to-use, free word processor. It affords standard functions like copy, cut, and paste, font styling, list numbering, tab defining, and much more. It functions as a drag-and-drop application: images, videos, and other media files are easily added to the Google Doc either by selecting a file or by dragging it into the document. Because its interface resembles most stand-alone application interfaces, newcomers to Google Docs can quickly start creating documents. Google Docs excels in sharing and collaboration. Files are easily shared from within the document using the upper-right “Share” button (see Figure 2) with the public, with members of the institution, or with specific individuals using an email address. Since a free Google Account can be tied to any email address, anyone with an email address can access a Google Doc. Google Drive affords customized group and individual sharing and permissions at the folder and file levels, so entire folders of Google Docs (and other files within a folder) can both inherit parent folder permissions or have custom permissions set. Sharing a Google Doc means that those given appropriate permissions may access and edit the file simultaneously. Simultaneous access and editing gives Google Docs a clear advantage over other word processors. Microsoft Word, for example, can share files and track changes, but only a single user may access the file at a given time. Google Docs tracks every change made by every user, and every change can be undone by rolling the file back to any previous state. The document is saved automatically after every change as long as stable internet access is available, so there is little concern about losing data as a result of unsaved changes. Google Docs affords unlimited commentary on highlighted text passages, and comments can be threaded to at least one level in subsequent responses. Comments can also be marked as resolved, an action that clears the on-screen comment thread but saves the entire comment text for access as needed. Users can respond to comments asynchronously or in real time during a composing session. In addition, synchronous in-document chat is available, meaning users can “text” one another as they work together on a document. The combination of collaborative tools makes Google Docs and Google Drive a versatile tool that affords group composing activities in synchronous and asynchronous contexts. As noted earlier, an institution’s decision to enter into an agreement to offer Google Apps for Education is fraught with questions of participant agency and data ownership. Even before a teacher makes decisions about using Google Docs for collaboration and composing, institutional administrators should recognize confluences that require cross-disciplinary and cross-departmental discourses involving IT departments, curriculum specialists, teachers, administrators, and students. All of these stakeholders in a distributed learning implementation should be encouraged to contribute to an ongoing conversation about best practices and lessons learned via implementation (Neff & Whithaus, 2008). And once the institution implements Google Apps for Education, the implications to students in the context of the class should be considered and communicated in the syllabus. Google is a for-profit multinational corporation whose ultimate goal is to generate profits for its stockholders. Entering into a business relationship with Google has costs that may not appear in institutional accounting spreadsheets, but will emerge in terms of power relationships between Google and the institution regarding data ownership, location, and access. More directly, as DePew and Lettner-Rust (2009) point out, asking students to use any technology inherently “shapes the power relationship between instructors and students[;] interfaces cannot be perceived as neutral or innocent” (p. 175). The goal of the decision to bind one’s institution to Google for its services and one’s students to Google Docs for its affordances should be one and the same: to empower end-users to make pedagogy-driven decisions about course content that are complemented by affordances of the technology tool (Hewett, forthcoming; Cook, 2005; Hantula & Pawlowicz, 2004). The decision to use Google Docs in the classroom should support the learning outcomes of the course. For online writing teachers, those outcomes include creating communities of inquiry that integrate cognitive, social, and teaching presence (Garrison & Vaughan, 2007); providing low-stakes student-centered composing opportunities and engaging student and instructor feedback (Warnock, 2009); reinforcing “critical and liberatory pedagogies” (Reilly & Williams, 2006, p. 59); and teaching and exemplifying meta cognitive reflection on the technologies themselves as applied rhetoric (DePew, forthcoming). Google Docs and Google Drive, as applications in Google Apps for Education, support these outcomes. Sharing folders and files supports the creation of a composing community focused on a common subject or object of inquiry. The teacher can create the shared environment using shared folders and a scaffolded writing assignment that requires file sharing among groups and associated feedback written work. The comments feature in Google Docs affords rich commentary and meta-commentary from students and teachers alike throughout the composing process, from low-stakes feedback in invention, drafting, peer review, and revision, to formal assessment from the instructor. Comments afford multi-way conversations that empower students to respond to peer and teacher feedback. Teachers can use Google Docs to reflect on the affordances and constraints of the technologies. By using the very technology they are assigned to critique, rich conversations about power politics, accessibility, availability, and other critical approaches can emerge and be facilitated by a trained, engaged teacher. More directly, Google Docs, like any other ICT in OWI, is both an object of critical analysis and a functional technology. As such, it affords opportunities to encourage students and teachers alike to practice applied rhetoric. And with the backing of the corporate behemoth that is Google, Google Docs provides a remarkably rich object of critical analysis and represents DePew’s (forthcoming) “pivot point where function and rhetoric merge” (n.p.). As a result, I recommend that teachers in both OWI and f2f environments consider incorporating Google Docs in their classes as a free and capable word processor and a highly collaborative, student-focused composing tool that functions as both medium for collaboration and assessment and object of rhetorical study. Garrison, D. R., & Vaughan, N. D. (2007). Blended learning in higher education: Framework, principles, and guidelines, (3-30). San Fransisco, CA: Jossey-Bass. Hantula, D. A., & Pawlowicz, D. M. (2004). Education mirrors industry: On the not-so surprising rise of internet distance learning. In D. Monolescu, C. Schifter, & L. Greenwood (eds. ), The distance education evolution: Issues and case studies (142-162). Hershey, PA: Information Science Pub. Neff, J. M., & Whithaus, C. (2008). Writing across distances & disciplines: Research and pedagogy in distributed learning. New York, NY: Lawrence Erlbaum Associates. Warnock, S. (2009). Teaching writing online: How & why. Urbana, IL: National Council of Teachers of English. In this article, Gillam and Wooden utilize ecological theory to describe the way in which writing courses should operate as learning communities as interconnected and collaborative. The central problem with online writing courses is that the current tendency in online writing pedagogy is to plan courses in a way that emphasizes the cognitive-process model, valuing the writer as a solitary individual who works alone, while more recent scholarship and best practices in composition studies place more emphasis on collaboration in a community of inquiry. One problem with online education is that the way in which course set-up tends to value and privilege strong writing and communication skills, the very skills that students should be developing in the course. Referring to Garrison and Vaughan, Gillam and Wooden explain that online courses encourage both personal but also purposeful relationships. They issue a call to action to their readers: bring the personal back into the class through collaborative group projects that make community a “content-oriented” goal of the course benefitting from the interconnectedness and collaborative nature of these activities. Gillam and Wooden advocate an online course that incorporates the principles of distribution (that learning is situated and negotiated between a variety of sources), emergence (the adaption and coordination in the process of creating knowledge), embodiment (through recognition that student embodiment impacts the process of learning and writing even in online classes), and enaction (the final product). In order to satisfy these principles, Gillam and Shannon describe an online course containing scaffolded assignments beginning with group negotiation of a topic of exploration, data collection via a group constructed survey (the design of which requires emergence and enaction), multimodal presentation of findings, a collaborative annotated bibliography, and an individual final project (a problem/solution paper accompanied by a reflection paragraph). The assignment helps students understand writing as ecological, writing for a community, and writing for a purpose instead of presenting writing as a solitary act done by an independent writer (35). While I am focused on hybrid course design, I felt that this article was beneficial for me to examine because of the focus on writing as enaction of the ecological. The notion that writing is the result of engagement in an ecology makes community-building in the writing course seems not only desirable but necessary. The writing that students do in their future careers will be ecological in nature-steeped as it will be in the conventions and purposes of specific discourse communities-so one could argue that writing instructors have an impetus to teach writing as ecological enactment. Another reason that I found this article very useful is that I was drawn to Garrison and Vaughan’s notion of “communities of inquiry” and part of the aim of my project will be to build such as community. After reading Garrison and Vaughan I still wasn’t quite certain how one might facilitate the building of such communities. Gillam and Wooden put the notion of “community of inquiry” into action in the course design that they discuss in this article. Mandernach, Jean B., Amber Dailey-Herbert, and Emily Donnelli-Sallee. “Frequency and Time Investment of Instructors’ Participation in Threaded Discussions in the Online Classroom.” Journal of Interactive Online Learning 6.1 (2007). 1-9. Google Scholar. Web. 9 Jun. 2014. The authors of this study acknowledge the significant investment of time initially required to prepare a course for online delivery; however, they are interested in the time demands on faculty in facilitating an established online course. This study aims to establish some “empirical information to guide the frequency and nature” of faculty involvement in asynchronous discussions; evidence-supported information the authors note as underrepresented in the literature (2). They argue that with students’ increased expectations for instructor availability, greater quantitative data about the investment of time is needed. This quantitative study evaluated a random sample of ten undergraduate courses that students rated as highly effective in promoting understanding of course material. The authors analyzed the course management archives for each course. The results indicate that faculty time spent facilitating discussions is highly variable: each week faculty responses ranged from 0-22 posts, their time logged in ranged from 22-450 minutes, and they logged in on 4-6.8 days. The authors conclude that facilitating discussions in “online courses may not take any more time than facilitating discussion in face-to-face courses, but that “the time investment is distributed differently throughout the week” with greater time spent working on the weekends being “one of the biggest shifts in online faculty workloads” (6). The authors caution that the study is limited in that it does not measure other means of facilitation that cumulatively require greater time demands. I find this study helpful in that it begins to measure the amount of time needed to complete the various functions of the online instructor. Anecdotally, teachers in online courses report that they are making a significant investment of time, but studies like this can provide the kind of administratively valued quantitative data needed when arguing for limiting online class size or reduction of teaching loads. As courses are encouraged to be moved online, considerations must be made for the workload inequity between online and face-to-face courses. The collation of previous studies of the increased demands on time and the value of discussion threads in the literature review are especially useful for building an evidence-based case for reasonable online faculty course loads and class sizes and for the pedagogical value of incorporating discussion when designing courses. I think that although the authors are not willing to suggest guidelines based on this study, it is useful as a starting point for new instructors wondering how much time to spend responding to students. The mean time spent in discussion boards was 187 minutes per week over a mean of five days each week. I think this is valuable because the students reported that these courses were highly effective, and with this in mind, instructors can remind themselves that daily, extensive involvement in discussion boards is not necessary: a little more than three hours over five days can be enough. This is obviously not the only responsibility of the online instructor, and more time will be spent in other ways, but it can help to find at least one boundary. Higher Colleges of Technology Google+ profile image. From the HCT Google+ page. This article reports early results of a higher education iPad® initiative implemented in a pre-Bachelor’s Foundation English Language Learning (ELL) program designed to prepare students for instruction delivered in English at 17 campuses of the Higher College of Technology in the United Arab Emirates (UAE). The objective of the study was to “identify faculty perceptions about the effectiveness of early implementation of the iPad, specifically as it related to enhancing the student-centered learning experience” (p. 46). The purpose of the federally-funded iPad initiative was to advance “active learning methods” in face-to-face classes in order to “provide students with the skills and experiences needed in flexible work environments” (p. 46). Faculty were trained in iPad implementation by Apple World Education leaders. The training and implementation program sought to “build excitement about the iPad implementation and camaraderie among the federal universities” using faculty champions and a teaching and learning conference focused on “ways to implement the iPad and engage students in active learning” (p. 46). Faculty spent the summer prior to fall implementation “playing” with the iPads to explore ways to engage with students. iPad 3 devices were provided free of charge to every student in each class with a combination of pre-installed free and paid apps. Using a combination of faculty case studies, faculty self-reporting survey results, and feedback from initial faculty champions, researchers organized and reported findings using a SWOT (strengths, weaknesses, opportunities, threats) framework. In each of the three areas (case study, survey, and feedback), researchers noted that “weaknesses and limitations were much lower in frequency and magnitude than expected for a first-of-its kind program” (p. 56). Faculty responded positively to the technology, pedagogy, and content in the first month of implementation. They reported that campus administrators and technologists “actively supported” their implementation efforts and that “the most frequent uses of iPads were for student-centered and interactive applications” (p. 56). They close the study with this endorsement: for institutions considering requiring incoming freshmen to use iPads, their results “indicate a favorable environment for success” (p. 56). The UAE government’s willingness to launch and fund a large-scale technology initiative is laudable, likely made possible by the UAE’s size. The state launched the initiative with extensive faculty training and engagement, a model grounded in theory and apparently effective, at least through the early stages of the initiative. Missing from the study was a focus on specific active learning methods implemented in classrooms. While the objective of the study focused on faculty perceptions, the goal of the iPad initiative to increase active-learning activities in the classroom begs examples and case studies of successful activities that met those goals. As a result, I recommend the study to administrators and grant funders seeking faculty buy-in for large-scale mobile device initiatives, not to teachers seeking examples of effective active learning activities. Essay in Inside Higher Education by Mary Flanagan, distinguished professor of digital humanities at Dartmouth College and a fellow of The OpEd Project. We need a culture change to manage our use of technology, to connect when we want to and not because we psychologically depend on it. Enough is enough. We need strategies for unplugging when appropriate to create a culture of listening and of dialogue. Otherwise, $20,000 to $60,000 a year is a hefty entrance fee to an arcade. While this conclusion resonates with me, as a technophile and college composition teacher I’d like a more nuanced approach to the encroachment of technology on the classroom environment. Sometimes students don’t recognize their reliance on the technology to alleviate boredom, to stay connected and “in the know,” or simply to distract themselves. I assigned an in-class collaborative writing activity in a networked computer classroom with a student population of working professionals. We used a shared Google Doc as our creative canvas, but I encouraged students in the written and oral instructions to use all affordances offered by the classroom. The result was absolute silence, less the tapping of keyboard keys. Rather than using the immediately-available affordance of face-to-face collaboration, students remained entirely engrossed in their technology-mediated collaborative space. I ended up reminding them that the classroom offered additional collaborative opportunities and tools, which prompted several of them to say a metaphorical Homer Simpson “Doh!” when they realized they could have simply talked to one another about the assignment. While this reinforces Flanagan’s conclusion that students need to unplug from their technologies and they need to understand how and when to unplug, I think students probably also need to understand and recognize their reliance on technology as an issue. This kind of education — that eliminates the need to whisper in a student’s ear that his or her technology use is inappropriate in that context — is an important part of our responsibility as technophiles in the classroom. Arms, Valarie M. “Hybrids, Multi-Modalities and Engaged Learners: A Composition Program for the Twenty-First Century.” Rocky Mountain Review 2 (2012): 219. Project MUSE. Web. 28 May 2014. 1. Use sound research, such as that into the connection between technology and students’ improving communication skills, as a foundation. 2. Information technology specialists can be helpful in finding innovative ways to use technology. 3. Pilot program teachers should be allowed and encouraged to take risks and share their successes and problems they faced. 4. Courses should use rubrics based on course learning outcomes, particularly for multimodal projects. 5. Allow student to be “agents of change” and take ownership through inclusion in program assessments. 6. Used mixed methods to evaluate the new pedagogies. 7. Submit proposals to administration at every level to solicit support and potentially grant money. 8. Once the pilot is concluded, disseminate the results to a broad community for feedback. She concludes by arguing that the program encouraged students and teachers to be creative, innovative, and motivated, and that it served as a reminder that “learning does not stop at the doorway to a classroom” (209). This particular article differs a great deal from previous articles I examined because the program is based on the idea that an entire generation of students (digital natives) are very proficient in the use of technology. While that may be the case with some students, certainly issues of access and skill result in an uneven distribution of technological skill and know-how that Arms does not really acknowledge. In contrast, Stine acknowledged these barriers while also arguing strongly for hybrid education. While Arms’ suggestions are helpful to someone developing such a program, those opposed to the idea of online education could easily argue that Arms is too optimistic about students’ technological skills and that issues developmental students face in particular are being ignored. The article would likely be of interest to those wanting to find innovative ways to approach WAC/WID. Also, the article was valuable to my own project, as it is helpful to see a detailed case study, rationale, and an explanation of how the results might be communicated to colleagues.